Despite the large progress obtained in recent years, Senegalese sole (Solea senegalensis) production of high quality juveniles is still a bottleneck. This paper examines the effect of larval and post-larval lipid nutrition on juvenile performance and quality. Four dietary treatments were tested: A—enriched Artemia spp. (EA); B—non-enriched Artemia spp. (NEA); C—EA during the pelagic larval period and NEA after larval settlement; D—50% EA and 50% NEA. Juvenile fatty acid profile at 60 days after hatching (DAH) clearly reflected the larval and post-larval diet composition. Feeding sole larvae on NEA (poor in lipids and essential fatty acids-EFA) had a negative effect, reducing growth (total length and dry weight) after 30 DAH and decreasing digestive enzyme activity at the end of the rearing period (60 DAH). 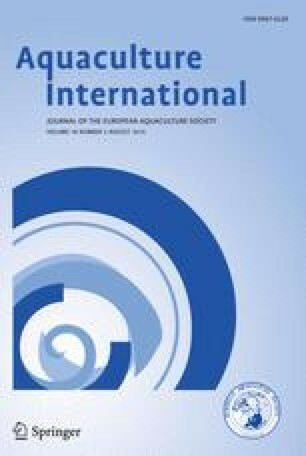 However, relatively good performance compared to the EFA-richest treatment (A) was obtained when larvae were fed 50% EA and 50% NEA (D) or even EA only during the pelagic larval period followed by NEA after larval settlement (C). Malpigmentation was not affected by the dietary regimes and its incidence was very low. However, skeletal deformities were prevalent, particularly in the caudal complex, independently of diet. The results confirm that Senegalese sole appear to have lower larval EFA requirements than most cultured marine species and potentially even lower requirements during the post-larval stage. The importance of studying the impact of early nutrition on later juvenile stages was clearly highlighted in this study. This work was partially funded by projects “PROMAR/SP5.P117/03” (INTERREGIII A) and “Tecnologias de Produção Aquícola” (22-05-01-FBR-00014; program MARE). L. Ribeiro and S. Morais were supported by “Fundação para a Ciência e a Tecnologia”, Portugal (grants SFRH/BPD/7148/2001 and SFRH/BPD/21766/2005, respectively).